CBAC Forecaster's Blog: No Niño?? For the past several years, much of the early season buzz about whether we were going to have a killer winter or a dud revolved (over. and over. and over...) about the pros and cons of an El Niño or La Niña atmospheric and oceanic signal. Here is a post from one of my former meteorology professors at the University of Utah and total powder junkie himself, Jim Steenburgh. He runs a great weather blog that discusses meteorology mostly around Utah, but a ton of his material is applicable to our locale as well. Bookmark it and check it out! Infer what you can about how the lack of ENSO will affect our weather patterns...the overarching theme being....your guess is as good as mine. A good perspective if nothing else. My take is that the Arctic Oscillation is just as big of a contributing factor that is often over looked. "The positive phase of the Arctic Oscillation brings ocean storms farther north, making the weather wetter in Alaska, Scotland, and Scandinavia and drier in the western United States and the Mediterranean. In the negative phase of the Arctic Oscillation the patterns are reversed. 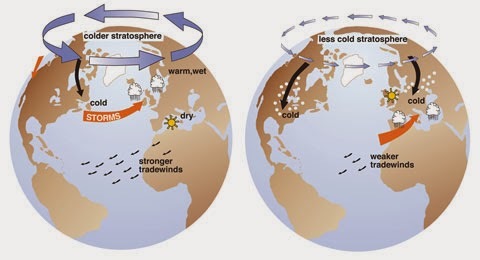 A strongly negative phase of the Arctic Oscillation brings warm weather to high latitudes, and cold, stormy weather to the more temperate regions where people live. Over most of the past century, the Arctic Oscillation alternated between its positive and negative phase. For a period during the 1970s to mid-1990s, the Arctic Oscillation tended to stay in its positive phase. However, since then it has again alternated between positive and negative, with a record negative phase in the winter of 2009-2010"(National Snow and Ice Data Center). What tilt are we in now you may ask?? These are very interesting (and confusing) but if you look at each graph, you have a neutral AO signal at zero, with the blue bars going up meaning positive, going down, negative. Makes you think a little what phase we have been in for extreme weather, like our early season snows, the Front Range floods in September, etc.